Steven Lawrence Gluckstein was born June 24, 1990 in Red Bank and grew up in Atlantic Highlands. He was the second of three kids born to Loretta and Steve Gluckstein, who worked on Wall Street. Steven studied Taekwando as a boy and then took gymnastics classes. Focused and precise, Steven was drawn to trampolining. His younger brother, Jeffrey, followed him into the sport. In 2000, trampoline became an Olympic sport. They were coached by Tatiana Kovaleva, the 1996 world champion. The two brothers soon distinguished themselves among the top competitors in the country. Jeffrey’s specialty was the height of his routines, while Steven’s was precision. For this reason, they did not make good synchronized partners. Steven began competing nationally at age 12, winning US junior titles each year from 2003 to 2006. He won his first US senior championship in 2009. That year, Steve and Logan Dooley won America’s first World Cup synchronized gold medal. Because trampoline meets involve both individual and synchronized events, many athletes are both partners and rivals. In Steve’s case, Dooley often filled that role. Over the next several years, Logan and the Glucksteins often finished 1–2–3. By the 2012 Olympic Trials, Jeffrey had become an elite-level competitor. Steven had four national gold medals under his belt at this point, with his brother taking silver behind him three of those years. Only one would make Team USA and travel to London for the Summer Games. Steven edged Jeffrey. Their mother went to the movies that day—it was too nerve-wracking watch her two sons compete. At the 2012 Olympics, Steven did not qualify for the finals after a landing on the safety mat in his second routine while trying to land a triple half-pike with a half-twist. For an athlete known for hitting the X, it was a shocking development. After the Olympics, the brothers continued to train and coach at Elite Trampoline Academy in Middletown. 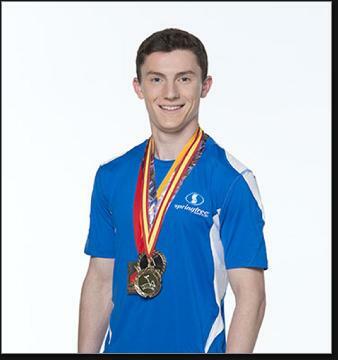 In 2013 and 2014, Jeffrey took gold at the national championships. In 2015, Steven reclaimed his title, despite having missed time after breaking his arm. He also won silver at the Pan American Games. The 2016 Olympic Trials found Dooley and the Glucksteins fighting again for a single spot. Dooley, the Olympic alternate in 2008 and 2012, actually went in as a slight favorite. Jeffrey crashed out in his first routine, while Steven had one of his best meets, winning individual gold. However, Dooley finished second in the individual event and first in synchronized, nailing down the Olympic slot on the strength of his overall performance plus the three selection points he had going into the competition. A couple of days before the competition, Steve married Brazilian trampolinist Camilla Lopes, whom he met at a 2011 competition in Denmark. Their romance blossomed in 2016 when she came to America to train at Elite. Steven went to Rio as an alternate but did not compete. Dooley finished 11th. Steven returned to Elite, where he and his brother are focused on passing the torch to the generation of aspiring champions. That being said, there will be a few more medals in the family trophy case before they are done.